Born at Belfast, Ireland on 2 November 1825, he was educated at Sandhurst and entered the British army in 1842. He served in New Zealand from 1846 to 1847, saw active service in the Indian Mutiny, 1857-58, then was stationed in Canada in 1868. 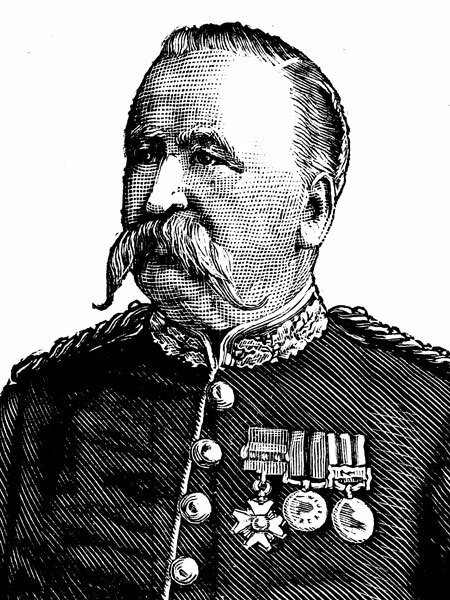 In 1884 he was promoted to the rank of Major-General and placed in command of the Canadian Militia. When the Métis and aboriginal unrest turned into armed conflict in March 1885, Middleton was despatched to the North West. For his successful services in suppressing the Riel Rebellion and capturing the rebel leaders he was granted a pension of £4000 and created a KCMG. In 1887 he was retired with the rank of Lieutenant-General but continued to command the Canadian militia until 1890. In 1896 he was appointed Keeper of the Crown Jewels at the Tower of London. He was married twice, first to Emily Hassell, and after her death to Eugénie Marie Doucet of Montreal. He died on 25 January 1898.